At Healthy Home™ Energy and Consulting, your home's health and safety is our concern! Combustion safety testing is especially important when you're planning on improving your home's performance through air sealing work. We can look after your furnace safety with a team from our Bedford Hills or Somers offices. Simply put, this testing will allow us to give your combustion appliances a checkup to measure their performance and identify any potential health and safety concerns. When they work properly, combustion appliances have a vent (chimney or flue) that completely exhausts dangerous combustion gases to the outside. When they don't, you risk being exposed to carbon monoxide (CO), a tasteless, odorless and colorless gas that can silently and quickly make your household very sick. If your appliances are sealed combustion units, there shouldn't be any problems, as there's no chance of backdrafting because of the way they are designed. Combustion analysis involves several tests, but the simplest one is the worst case Combustion Air Zone test. When we do a CAZ test, we start by measuring the baseline pressure in the house with all the combustion appliances on "pilot" or "off" and all the interior doors closed. Then, our combustion tester will create a worst case scenario for depressurizing the house by turning on the dryer and all the exhaust fans. If the test results are beyond certain targets and standards, then our team will make recommendations on what you need to do. Other tests for combustion safety include checking for proper draft pressure, monitoring for CO and other performance testing. 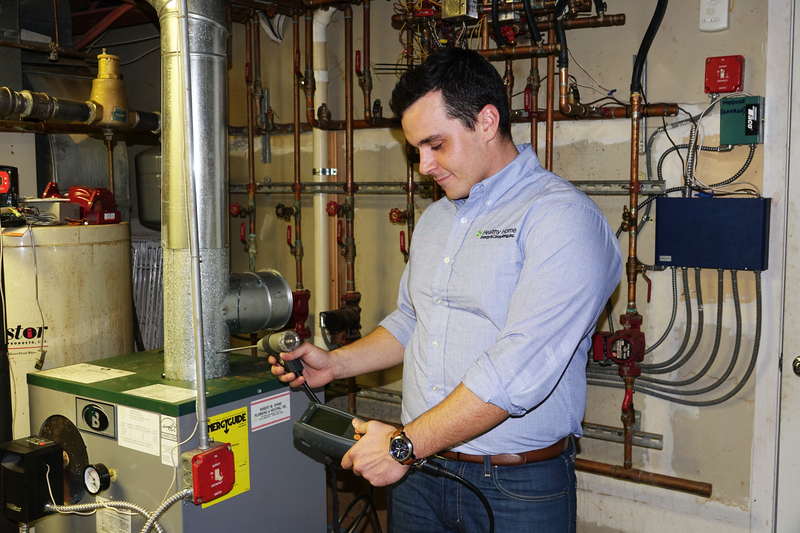 We can test all of your combustion appliances with our modern flue-gas analyzers during an energy audit, when we repair or maintain your furnace or boiler, or when we carry out a heating equipment replacement. Don't wait! Contact Healthy Home™ today if you are concerned about combustion safety in your house! Make sure your systems are operating safely! Get peace of mind with combustion testing.